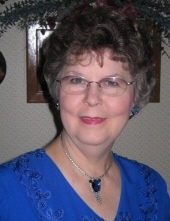 Martha Prestwood, 78, of Petal died Thursday, March 28, 2019 at Asbury Hospice House. Visitation will be Monday, April 1, 2019 from 1:30 p.m. until the service at 3:00 p.m. at Moore Funeral Home in Petal followed by burial in Highland Cemetery. Mrs. Prestwood was a member of Macedonia Baptist Church. She was preceded in death by her husbands, John R. Klem, III and Benard Jones; her parents, Mabel Newberry and Bordelon Passman and three brothers, James Elvin Passman, Robert Passman and Ned Passman. She is survived by her husband, Austin Prestwood; three sons, John (Lisa) Klem, James (Linda) Klem and Mark (Lisa) Klem; six grandchildren; two great-grandchildren; one sister, Virginia (Layne) Sanders and two brothers, William (Geraldine) Passman and David Passman. To send flowers or a remembrance gift to the family of Martha Prestwood, please visit our Tribute Store. "Email Address" would like to share the life celebration of Martha Prestwood. Click on the "link" to go to share a favorite memory or leave a condolence message for the family.